Salumeria Rosi is a gastronomica with tables crowded close for dining. Photo by Dana Stoddard. 1.When Cesare Casella was orchestrating the cured meats and pastas at Salumeria Rosi, the tight little gastronomica he had been charged with installing on Amsterdam Avenue, my guy and I ate there two or three times a week on nights not dedicated to exploration. Rigatoni all’amatriciana was his choice. I planned to order that Roman classic a few weeks ago when my niece Dana and I stopped by for dinner. What a stunning moment to taste the perfect al dente spaghetti cacio e pepe at Salumeria Rosi. Dana focused on the roasted butternut squash soup, sweet from crumbled amaretti cookies. Then the waiter listed spaghetti cacio e pepe among the specials and that was it. I had to have it. I managed to swirl my first bite. I tried to recall the last time I’d bitten into a noodle so perfectly al dente. It brought back memories of summers in Tuscany and made most recent noodles seem limp. I count that my Best Bite of the year. 283 Amsterdam between 73rd and 74th streets, 212 877 4800. In every visit to Eléa, we always order the tower of zucchini and eggplant chips. 2. The kitchen at Eléa, the new Greek outpost on West 85th Street, takes a while to deliver the crisp fried zucchini and eggplant-chip tower with a side of tzatziki alongside. My dinner companions are focused on the crisps and don't even notice the fried Kefalograviera cheese lolling on the platter. “It’s fried cheese,” I say. “Try one. They’re delicious too.” The house baked spelt bread also deserves an award. 217 West 85th Street between Broadway and Amsterdam. 212 369 9800. Pomona’s duck leg confit burger on orange brioche is a marvel of chefly commitment. 3. If you followed Chef Michael Vignola from Henry’s at the Life Hotel to the beige and brown subterranean Pomona, you won’t be surprised by his new triumphs: the spicy carrot cavatelli, the confit duck-leg burger with grapefruit jam on house-baked orange brioche, or the do-not-miss vegetables, black truffle cream escarole and the goose fat potatoes sardalaise with sour cream. Good, good, good. Crisp fried sun chokes with rosemary and pecorino make a side that can be the point of dinner at Pomona. But for me, the dish not to miss is a side of crispy ripped sunchokes with rosemary and pecorino. I ordered a bowl as my dinner last week and didn’t offer to share with anyone. 8 West 58th Street between Fifth and Sixth avenues. 212 753 1200. There’s always someone wanting to share the soft scrambled eggs at Frenchette. 4. I couldn’t wait to taste what chef partners Riad Nasr and Lee Hanson would do at Frenchette in Tribeca. We were five that first week, and ordered one of everything. It was the creamy, barely scrambled eggs with sea urchin that moved into this hall of fame immediately. Later when escargot replaced the uni, the dish slipped a notch, but even so, it’s still historic. 241 West Broadway between Walker and White streets. 212 334 3883. It’s a stab in the dark when you choose a dish from Le Bernardin’s long list. But my kampachi in a winner. 5. Having discovered Gilbert and Maguy Le Coze decades ago on the Quai des Bernardins and followed their quest for a home in Manhattan, I feel like family on West 51st. But I hadn’t eaten at Le Bernardin in a long while. I’d forgotten how challenging it can be to settle on just two options from the long listing of partner Eric Ripert’s latest notions. It’s a little bit like playing the lottery, and this time I win. My kampachi sashimi slices drizzled with crushed Niçoise olives anchored by islands of Greek salad is definitely a Best Bite of the year. 155 West 51st Street between Sixth and Seventh avenues. 212 554 1515. Once I tried La Goulue’s smoked duck potato tart, I couldn’t imagine lunch without it. 6. I’m not a La Goulue type, but with its revival on East 61st in an almost exact replica -- including its Upper East Side regulars -- I found myself at a prime round, meeting my pal Harriette for lunch. As usual she ordered the tuna tartare with wasabi miso, fresh coriander and crispy tempura bits. I rarely eat lunch out and it’s a good thing all my pants have elastic at the waist, because the baked goat cheese and smoked duck potato tart with a dollop of crème fraîche on top would be a midday temptation. And a Best Bite too. 29 East 61st Street between Madison and Park avenues. 212 988 8169. We waited too long to order and UWS Red Farm had sold the last soft shell crab. What a tragedy. 7. When Red Farm opened on Hudson Street, I was there to binge on dim sum by Joe Ng. When it seeded its uptown entry on Broadway just north of my home, I staked an early claim. Obviously, the chef’s uniquely crisp soft-shell crab is not new. But 2018 was the year I discovered how I’d suffer if the kitchen sold out before I arrived. The tart, slightly sweet bath the seasonal critter floats on is a blend of yuzu and Meyer lemon sauce with bits of scallion, and red and green pepper. 2179 Broadway between 76th and 77th streets. 212 724 9700. I’m including a photo of the sliced steak just to remind myself that Porter House is mostly about meat. There are great steaks everywhere, but not many perfectly cooked hash browns like these at Porter House. 8. Porter House in the Time Warner Center is one of my habits. And the crisp island of hash brown potatoes is a Best Bite every year. 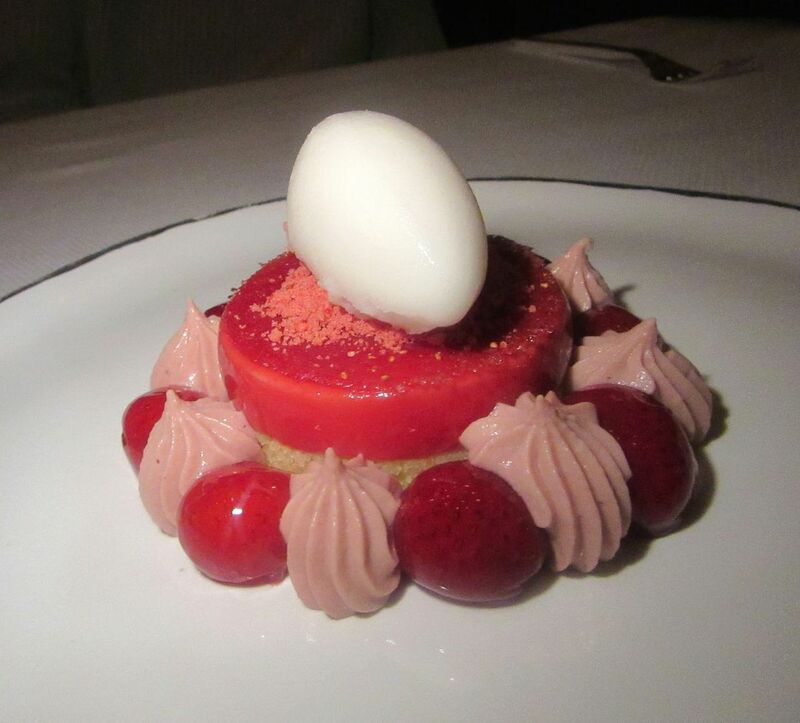 My friends and I often try to skip dessert after steak and fries, but Chef Michael Lomonaco foils us. This year I was confronted with pastry chef Wayne Harley Brachman’s chocolate brownie hot fudge sundae. And it won. The BITE fatale. Time Warner Center, 10 Columbus Circle at 60th Street. 212 823 9500. Bistro Pierre Lapin’s rolling cart of vegetable salads revives the classic French hors d’oeuvre tradition. 9. When I first became the restaurant critic of New York Magazine and got to have lunch at the le’s and la’s on someone else’s dime, I never could resist the hors d’oeuvre variés. And so far I’ve yet to resist the ravier, a collection of salads on a rolling cart at Bistro Pierre Lapin. Grated carrots, green lentil salad, smoked eggplant caviar, marinated beets, celery remoulade, leeks vinaigrette. I might share this overture with a friend to leave room for chef Harold Moore’s classic quenelles de brochet. 99 Bank Street between Bethune and Greenwich 212 858 6600. Count on chef David Burke to imagine broccoli “mops” to drag through guacamole. 10. Woodpecker in Nomad is a Westside theater for David Burke’s usual whimsy. I’m not amused by the cricket pizza, but I like the idea of dragging broccoli “mops” through guacamole with quinoa, citrus and fennel. His hipster fries tossed with bacon, Parmesan, chili oil and shishito are also a 2018 find. 30 West 30th Street between Broadway and Fifth Avenue. 646 398 7664. Order dishes you’ve never tried before like these crusty bourecka at Gazala’s place on Amsterdam. 11. Gazala on Amsterdam is full of revelations. Gazala Halavi herself is one. The story of the Druze people is another. The dishes listed on the vast menu sound familiar but they mostly aren’t. Order the crusty boureka rounds filled with sheep’s milk ricotta and zatar or tomato and cheese. If the server is a newbie and doesn’t know what you’re talking about, ask for a conference with Gazala. 447 Amsterdam between 81st and 82nd streets. 212 787 1800. Vegetables and pastas are Missy Robinson’s obsession at Misi in Brooklyn. 12. Missy Robbins smartly focuses on pastas and vegetables at her new Misi in the historic Domino Sugar Refinery in Brooklyn. Radicchio and cipollini onions are tossed with melted bone marrow, balsamic, and ricotta salata, and oil-poached zucchini cubes mix with capers, oregano and toasted bread chunks. But the Best Bite for me is the garlicky pappardelle made with chickpea flour and topped with toasted garbanzos and rosemary. 29 Kent Avenue between 3rd and 4th streets, Brooklyn. 347 566 3262. Monday through Sunday, 5:30 pm to 11 pm. I come to Porterhouse for steak and hash browns but the chocolate sundae with brownies is a knockout finale.